Feed your soul with the rush of adventure! 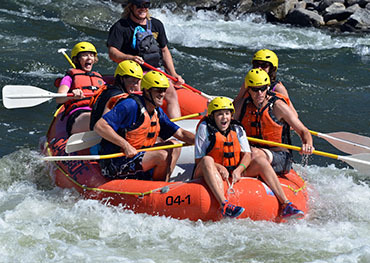 From Garden Valley to Banks, this eight-mile section of rollicking class III-IV rapids will launch you into an unforgettable whitewater experience. While you conquer rapids with names like Bronco Billy, Staircase, and Slalom you'll still find time for relaxation. A combination of whitewater excitement and convenient access make this trip a must for the adventurous. Get wet and wild as you plummet thirteen miles down one of the West’s most magnificent river corridors. The steep class IV drops, towering canyon walls, and clear water make this Idaho's premier whitewater day trip. The power of thundering Big Falls, a portaged 40’ waterfall, is undeniable. A gourmet riverside lunch will be prepared and served by your guides so you can relax and re-fuel at midday. From Garden Valley to Banks, this eight-mile section of rollicking class III-IV rapids will launch you into an unforgettable whitewater experience. On this exciting section of river, you will descend rapids including Bronco Billy (class IV), Dog Leg (class III), Tight and Right (class III), Staircase (class IV), and Slalom (class IV). 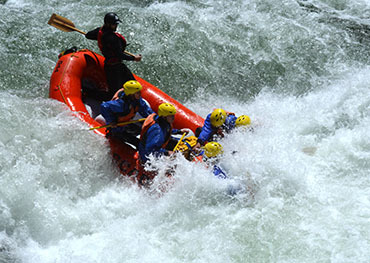 Be prepared to get drenched by big waves that splash over the raft as you paddle downstream. The length and more technical nature of these rapids create an exhilarating whitewater challenge, but you’ll still find time for relaxation between the rapids. 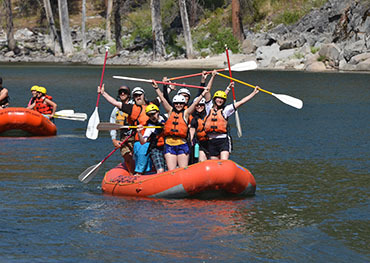 For safety, we require that all rafters on our Lower South Fork trip fit properly into an adult-sized lifejacket. This trip is recommended for those weighing over 95 pounds and over 12 years of age. 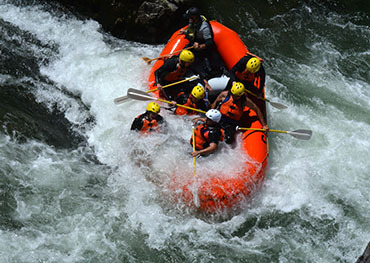 A combination of whitewater excitement and convenient access make this trip a must for the adventurous. Full Day South Fork "The Plunge"
Get wet and wild as you plummet thirteen miles down one of the West’s most magnificent river corridors. The steep drops, towering canyon walls, and clear water make this the legendary crown jewel of continuous Class IV rapids. The Canyon features continuous class III and IV rapids some of which include Oxbow, Gateway, Blackadar, Lone Pine, Little Falls, and Surprise. 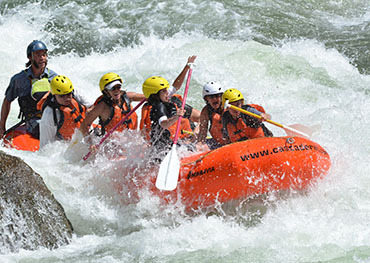 The successful negotiation of these rapids requires energetic paddling and teamwork under the direction of our most experienced guides. After a few miles, we will disembark to portage Big Falls (an unrunnable 40 waterfall) and admire its beauty and power. A gourmet riverside lunch will be prepared and served by your guides so you can relax and re-fuel at midday. 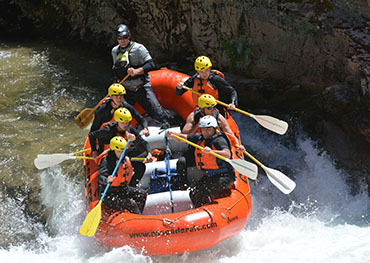 For safety, we require that all rafters on our South Fork Canyon trip fit properly into an adult-sized lifejacket. This trip is recommended for those weighing over 95 pounds and over 12 years of age. Bring your spirit of adventure and we’ll provide the rest.